Tonight we made two new friends over dinner - Francois Mauss from the Grand Jury Europeen and Cecilia Roger from Morgassi Superiore. 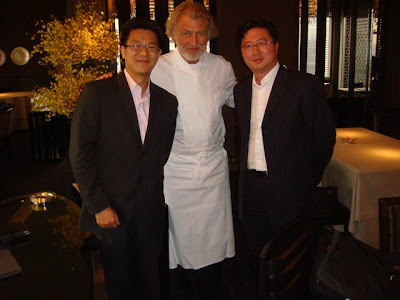 Both were in town for Vinexpo, and both have been away from Hong Kong for more than 20 years. We had a casual dinner at the Fortune Room at the Jockey Club. Francois had requested a Chinese dinner, and we had a free hand in ordering since he and Cecilia both told us that they eat everything. We started with a suckling platter, consisting of roast pork (叉燒), roast suckling pig (烤乳豬) and jelly fish (海蜇皮). This was well-received by our guests. Next we had consomme with beef shank, which was light and delicious with very tender slices of beef shank. Wonderful. The first two dishes were paired with the 2001 Ramonet Puligny-Montrachet 1er Cru Champs Canet. A very elegant wine with toasty oak, sweet grass, sweet butter on the nose. Medium acidty on the palate. This wine is fresh and showed lots of finesse. Next we had scallops stuffed with shrimp paste and crab meat. Pretty yummy as well. This was followed by the black pork with beancurd sheets and eggplant. The eggplant was pretty flavorful. These two dishes were accompanied by the 1983 Leroy Meursault Les Narvaux - another great wine. The nose was very sweet with honey, apricot and pear notes. The palate had a touch of sweetness and not much acidity compared to the Ramonet. The nose had clearly oxidized somewhat, like a pear that had been cut open and sat around. At the end of the dinner, the few drops left in our glasses showed what a truly amazing wine this was. The first main dish was braised veal shank in claypot. A heavier dish, this nonetheless impressed with the Chinese five spice. We followed this with crispy fried chicken, where the meat was moist and tender. The two reds that Francois brought along were both delicious and excellent value for money. The 2004 Rollan de By was pretty delicious for a wine that costs EUR 8 a bottle...nose of sweet fruit, a bit of smoke, lead pencil and that medicinal/antiseptic nose that comes from brett. Drinks pretty well but finish a tad short. The second bottle was the 2002 Haut Condissas, with a much sweeter nose, also a bit of smoke, pain grille and (dare I say) oriental spices. A more complex wine with a longer finish, this is again excellent value at only EUR 15. We finished the meal with stir-fried kale with wine, sugar and ginger. Cecilia really appreciated the something extra which is brought out by the ginger. We had a great evening enjoying these fine wines, and exchanging ideas about the world of wine. I hope to see both Francois and Cecilia at Vinexpo in the coming days, and made a date for lunch with Francois later in the week. Needed a place for dinner last night, and decided to give the Pawn another try. Fortunately they weren't so packed on a Sunday night, and I got us a table with an early seating. For main course I picked the classic fish and chips, based on the recommendation from one of the owners on my last visit. The plate was huge, as was everything on it. The batter was crispy and yummy, with so much oil soaked in it that the aftertaste was wonderful. The fat fries were also crispy and stayed that way. The peas were not mushy. It was just as had been promised. We ordered three desserts to share: the Eaton mess plus the lemon trifle and the treacle tart which I had on my last visit. All were excellent, with perhaps the Eaton mess being the most interesting due to its presentation - it was a messy pile of strawberries and cream and other ingredients. I had brought along a bottle of 2005 Guigal Condrieu La Doriane. It showed a nose of minerals, citrus lemon and a bit of butter; with a medium sweet palate and a "hot" and spicy finish. It was a yummy wine, but disappointing to me because it did not taste like a Condrieu. Where was the overpowering floral nose that comes from the Viognier? Frankly this wine tasted like a Chardonnay from a ripe vintage - in fact it tastes like a 2005 white Burgundy. I cannot help but feel a little cheated. Have been planning a dinner for people on the team who love to eat, and we kept rescheduling the gathering due to conflicts. Finally, we have an evening when most of us are in town, and we made it to Fook Lam Moon (福臨門) last night. My friend Dustin, who is a regular at the restuarant, very kindly made the reservation for me along with a few dishes which must be ordered in advance. While we waited for everyone to arrive, we popped open the 2005 Zind-Humbrecht Gewurztraminer Turckheim. Everyone identified the intense lychee nose immediately, and there was also a hint of minerals. The wine was so sweet on the palate, more than I expected, and tasted a bit "hot". I checked the bottle and found that it was 15% alcohol. No wonder! But given that this came from 2005 I suppose I shouldn't have been surprised. They obviously picked from very, very ripe fruit. We started with the roast suckling pig, which was rolled into the room on display. This is alwas delicious, and I love the paper-thin, crisp slices of the skin. I had a taste of the ribs, but didn't get to gnaw on one of the legs this time. We paired the 1999 Clos Mogador with the pig. The first whiff of the nose showed lots of power, with sweet vanilla and fruit. Taking the first sip, however, I was a little disappointed. The acidity struck me, and I thought that this wine would turn out to be more traditionally Spanish than I had hoped for. Fortunately the acidity faded, but the wine was still tannic on the palate with a long finish. Not what I had hoped for. Next up was the wintermelon soup (冬瓜盅) - a great dish for the hot summer days as it cools the body. In addition to the melon, we had lotus seeds, chicken, roast duck and frog legs in our bowls. Very freshing and I had a second serving. Due to a miscommunication with Dustin, we ended up ordering the deep-fried chicken testicle tofu (炸雞子). Thankfully I asked them to reduce the amount being served. Some people at the table knew what this was, while others suspected something was up, but finished the tofu anyway before the answer was revealed. We were served a big plate of fried giant pomfret (香煎大鯧魚), always my favorite. The slices are just so yummy with the crispy surface and the soft and moist interior. I chose to dip it in the mayo this time. With the pomfret, we had the 2003 Hugel Gewurztraminer Jubilee. This was much lighter and more floral than the Zind, and still with a hint of lychee. Each of us was served a crab shell with baked crabmeat (釀焗鮮蟹蓋), baked au gratin to perfection. Worked well with the Worcestershire Sauce and so much better than the one I had at Farm House (農圃). The crab meat was just so fresh and sweet, it was just good blended with strips of celtuce stems (萵筍). We had sweet and sour pork (咕咾肉) at the request of the ladies, and crispy fried chicken (炸子雞) as well as wolfberry leaves with pork liver (上湯枸杞葉與豬潤). The chicken skin was nice and crispy - perfect, in fact. The wolfberry leaves were a novelty since I have never had it, but it was a little bitter. The second red was the 1997 Pahlmeyer Red, which had plenty of sweet fruit and vanilla in the nose. The tannins were round and smooth on the palate, and I liked it better than the Mogador. We were very full, but I took in a bowl of mung bean soup (綠豆湯) for dessert anyway. This was a long time coming, but I think we were all pretty happy by the end of the evening. Last night I caught up with some friends over dinner at the Legend Concept, the private kitchen which I had just visited a few weeks ago. As happens very often, we had the place to ourselves and it turned out to be a very enjoyable evening. We started with the 2005 Bernard Morey Chassagne Montrachet 1er Cru Morgeot. This was very ripe, sweet with chewy fat on the palate. Classic toasty oak and minerals on the nose, with a medium long finish. This wine is ready to drink now, given the power of this awesome vintage. The appetizer was baby abalone, which was marinated with soy sauce. Unfortunately the sauce was a little bland, so the natural "fishy" taste was a little too prominent. The artichoke hearts on the side were interesting but I wasn't sure how it added to the dish. Next we had mushroom consomme, which was really disappointing. It tasted like the product of simply soaking dry mushrooms in hot water, something I do at home as preparation. Am I being harsh? Perhaps. But by this point I was thinking that dinner would be a very different experience compared to a few weeks ago. This was followed by pan-seared scallops with risotto. The scallops were fresh, tender and sweet, if again a bit bland. The accompanying risotto was done fairly well, a little al dente. We started on the 1998 Hacienda Monasterio Reserva Especial. Now this was an interesting wine, made by Peter Sissek of Pingus fame. The nose was classic Right Bank Bordeaux, sweet and ripe, with familiar farmy, gamey notes. It was a full-boded wine and the tannins were still pretty heavy. Very delish for a Bordeaux blend from the Ribera del Duoro. We were given a nice watermelon sorbet to cleanse our palate. This has become the highlight of the meals here. I'm gonna have to learn how to make these at home. The main course of spring chicken roll was quite an interesting creation. Take giant prawns, roll a layer of calamari paste around it, wrap a layer of nori seaweed, and stuff it all in a shell of spring chicken. Cut into slices, the flavors actually worked well together. The second red of the evening was the 1995 Shafer Hillside Select. Ripe fruit in the nose as one would expect from a Californian, but after a while the wine was actually more like a Left Bank Bordeaux. A very full-bodied wine, but a little disappointed. To accompany dessert (a nice Napoleon) , we had a half bottle of the 2004 Suduiraut, which had lots of ripe apricot, melon, orange and honey. A little young but already delicious, and a perfect way to end the evening. Hung out at a friend's place this afternoon to taste some yak cheese from Qinghai and had some fruit. I thought it would be nice to have some wine with the cheese so I brought 2 bottles of Condrieu along. The first bottle was the 2000 Guigal Condrieu La Doriane. When I had this wine last year, I was disappointed coz it was over the hill. Judging from the color of the wine in bottle, I felt it was probably gonna be the same this time. And sure enough, after pulling the cork and pouring the wine into glass, it was exactly the same as last time. It's quite a full-bodied wine and had a lot of depth and complexity, but it just wasn't fresh anymore. The fresh, floral nose that is typical of Condrieu and Viognier had vanished. With time, the nose improved and I definitely found Anjou pear, a hint of lychee as well as honey in the nose. The finish was reasonaly long and you could tell that once upon a time it had been a great wine. Lesson learned? Stick to La Doriane but next time, drink it within a couple of years after release.